Schwarz Collection; Edward H. Molyneux, Paris; Ailsa Mellon Bruce, New York; gift to NGA, 1970. French Paintings from the Molyneux Collection, National Gallery of Art, Washington, D.C.; Museum of Modern Art, New York, 1952, unnumbered checklist, Portrait of the Artist's Sister. French Paintings from the Collections of Mr. and Mrs. Paul Mellon and Mrs. Mellon Bruce, National Gallery of Art, Washington, 1966, no. 235, repro. "Berthe Morisot", Palais des Beaux-Arts de Lille, 2002, no. 8, 116-117. Bataille, M.L., and Georges Wildenstein. 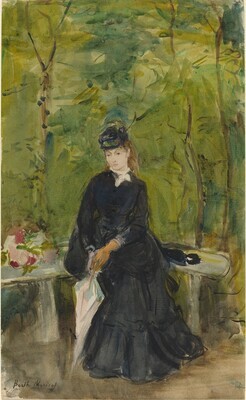 Berthe Morisot, catalogue des peintures, pastels et aquarelles. Paris, 1961: 611 (as "Jeune fille sur un banc").